Fall Classic, to be specific. 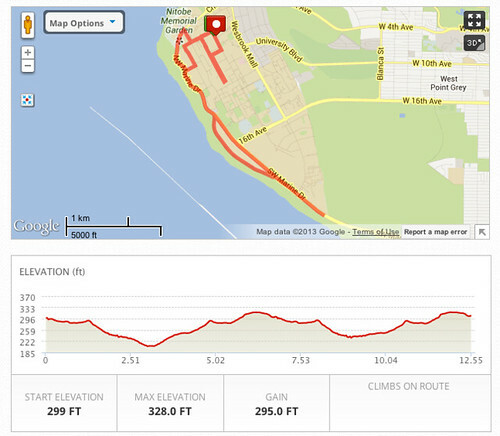 Plus, as you can see from the elevation chart above, it’s a wee bit hilly, and we know how much I love hilly half marathons. But unlike the Edge-to-Edge, (a) I’m going into this with my eyes open that there will be hills, (b) I know these particular hills, as I’ve done my fair share of running out at UBC, and (c) I’m actually doing some hill training this time! Also on the plus side, it’s a local race, whereas the other fall races that we were looking at were all ones that involved traveling somewhere. Not like any crazy cool destinations, but just far enough that we’d have to take a ferry or drive a long time and get a hotel and whatnot. 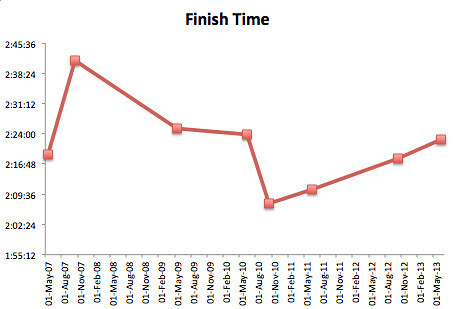 As you can clearly see, my finish times have gotten steadily worse since my personal best in October 2010. 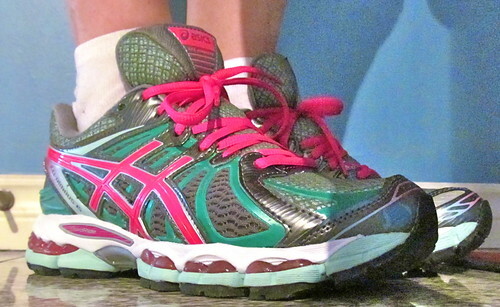 Note that the abysmal finish of October 2007 was the result of a foot injury – I had to limp the last ~6 km of that race. But if things keep progressing the way they are going, I’m going to be taking that long to run a half marathon without an injury! In an attempt to stem this tide, I think I’ll need to be a little more serious about my training – and my stretching and foam rolling, this time around. 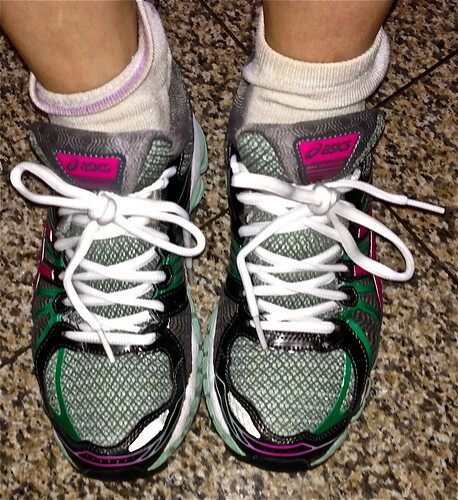 So my new laces are not only performance-enhancing, but they also make rainbows happen!